After the Hurricane Hits • Run Hard. Rest Well. Some of us watched images of TRAGEDY flicker on a screen before us this September as destructive hurricanes tore through the islands of the Caribbean and the southeast states of the United States. Some of us lived it. This post is for you who are living it. You – whose homes were swallowed alive in the deluge of water and wind. I have two small gifts from my heart to yours. I pray you find in each the One who mends shredded souls and gives a glimmer of hope on the darkest night. One is a gift from Brennan Manning, tucked away in his book, Abba’s Child. Number two is a prayer. It was my prayer. It is my prayer, when I can’t go on. 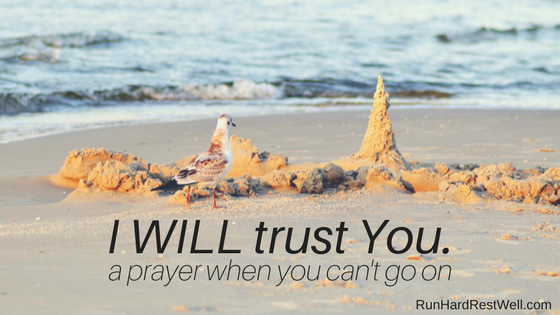 This 4-word prayer was my constant and only prayer in my darkest days – when to breathe felt almost impossible. Years later, when tragedy struck again, I came to realize the beauty and power of each word. Me. Unmoved by others’ feelings, actions, or responses, this prayer begins with me, the only one, the only thing I can control. Those around me may join me in this prayer. They may reject it. They may scoff, rejoice, or encourage, but this is my prayer to pray. It starts in a desperate heart. I can be afraid if I want to, but I don’t have to be. PS. It’s OK if I am. Jesus meets me right where I’m at – every time. During the fiercest days of my life, a season when one child was in Hospice Care and another was in a children’s hospital 3 hours from our home (for 7 weeks), our house flooded, and my dad was dying, I wore the same shirt every day. I really did. Written across the front it said, TRUST. Wearing that shirt was my daily declaration of the only thing that got me out of bed: trusting that Jesus would get me through every raw and rugged hour of the day before me. I could have prayed, “I will trust Jesus.” Seasons like this kind, for me, can’t be third person. I had to go toe-to-toe with God every hour, often with a cascade of tears dripping from my face. I would have never made it through if I had only talked about Jesus. I had to talk to Him. Only a face-to-face and heart-to-heart would do. No matter what kind of hurricane tore through your home . . . and heart. How totally and accurately these simple words are. Each moment of each day we are faced with decisions of what we will do and how we will respond. I can’t see the future. I can’t say if healing will come this side of the heavenly veil, but I choose to believe that I serve a good and loving God Who will carry me through each and every trial I face. I choose to stand, when everything around me is falling, on the Word of God and His promise. He will never fail me or forsake me. My Lord and Savior is today, as He was 2000 years ago, a God of Redemption and restoration. I choose to believe. Yes! Standing with you — cradled in His arms.